Bordeaux, Champagne, Spirits & More | Celebrate Summer | Skinner Auction 2734T | Skinner Inc.
BOSTON, Mass. – June 10, 2014 – Skinner, Inc. will hold a Fine Wines – Online auction beginning June 17, 2014 at 10:00 AM EST and concluding on June 26, 2014 at 4:00 PM EST. With over 900 lots of wines, beer, and spirits from across the globe, the auction offers an approachable and exhilarating selection. New and seasoned collectors will find excellent options to lay down alongside celebratory single bottles perfect for graduations, weddings, and other personal milestones. A collection rich in Bordeaux and California wines anchors the Fine Wines – Online auction, highlighted by Chateau Mouton Rothschild 2000 (12 bottles, Estimate $10,000 to $15,000). 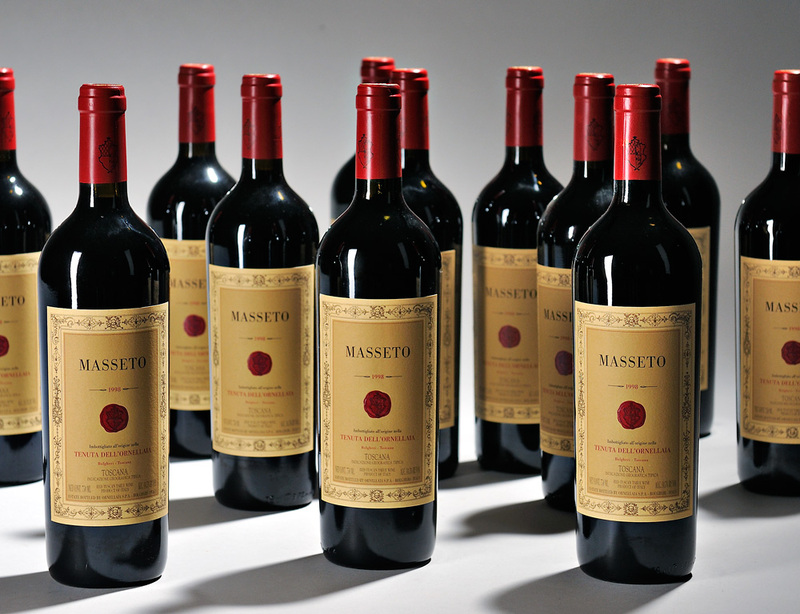 Italian wines from Sassicaia, Ornellaia, and Masseto are sure to delight. Fine Champagne, Burgundy, and Australian wines, including Penfolds Grange, round out the collection. Full cases, verticals, and mixed cases provide a road map to those looking to explore terroir, vintages, and pairings. California is on the mind in this auction, from Harlan 1993 and 1995 to Screaming Eagle 2007 (1 bottle, Estimate $2,000 to $3,000) and 2011 (2 bottles, Estimate $2,400 to $3,500). Bordeaux, the perennial auction star, is well represented with cases of first growth and many classified chateaux, from the first growths like Chateau Lafite Rothschild 1999 (12 bottles, Estimate $6,000 to $9,000) to fifth growths such as Chateau Pontet Canet 2010 (12 bottles, Estimate $2,700 to $3,750). Manfred Krankl’s iconic and iconoclastic wines, Sine Qua Non, also make a fine showing with six bottles each of Five Shooter Grenache 2010 (Estimate $1,000 to $1,500) and Five Shooter Syrah 2010 (Estimate $900 to $1,400). Another lot of Sine Qua Non includes three bottles each of The Duel 2008 Estate Grenache and Syrah (Estimate $2,000 to $2,800). Riding on a wave of high and focused interest, Pappy Van Winkle is represented by several bottles of 15, 20 and 23 Year bourbon, highlighted by a Glencairn Crystal decanter set of Old Rip Van Winkle Family Selection 23 Year bourbon hand selected by Julian Van Winkle (1 bottle, Estimate $4,500 to $6,000). Other spirits on offer include selections from Willett, Black Maple Hill, A.H. Hirsch and others. After becoming the first brick-and-mortar auction house to offer beer at auction, Skinner continues its successful foray into this emerging market with several lots of fine ales, including Cantillon Don Quijote 2008 (1 bottle, Estimate $2,000 to $3,000), Samuel Adams Millennium (1 bottle, Estimate $1,000 to $1,500) and Drie Fonteinen Oude Geuze 1999 (1 bottle, Estimate $400 to $600). The ten-day online wine auction combines the convenience of an online platform with the confidence that each lot comes from carefully vetted cellars and is backed by expert knowledge. Bidders can participate easily from home, with the understanding that Skinner fine wine specialists are available to answer questions. View the catalog online at www.skinnerinc.com. To participate, create an account on the Skinner website. To arrange for a preview, please contact Marie Keep, Director of Skinner’s Fine Wines Department, at 508-970-3296 or finewines@skinnerinc.com. Skinner auctions draw international interest from buyers and consignors alike, with material regularly achieving record prices. The company’s auction and appraisal services focus on fine art, jewelry, furniture, and decorative arts from around the globe, as well as wine, fine musical instruments, rare books, clocks, Judaica, and more. Monthly Skinner Discovery auctions feature a breadth of estate material. Widely regarded as one of the most trusted names in the business, Skinner appraisers have appeared on the PBS-TV series, Antiques Roadshow, since the show’s inception. Skinner has galleries in Boston and Marlborough, Massachusetts, as well as in Coral Gables, Florida, with an international audience of bidders participating in person, by phone, and online through the SkinnerLive! online bidding platform. For more information and to read our blog, visit the website at www.skinnerinc.com, find us on Facebook at https://www.facebook.com/skinnerauctions, or follow us on Twitter @Skinnerinc. This entry was posted in News and tagged Australian wines, beer, Bordeaux, bourbon, burgundy, California wines, Cantillon Don Quijote, champagne, Chateau Lafite Rothschild, Chateau Mouton Rothschild 2000, Chateau Pontet Canet, Drie Fonteinen Oude Geuze, fine ale, fine beer, Fine Wines, Five Shooter Grenache, Five Shooter Syrah, Manfred Krankl, Marie Keep, online auction, Pappy Van Winkle, Penfolds Grange, Samuel Adams Millennium, spirits, wine by Skinner. Bookmark the permalink.